Recalibrating temperature offsets using the Scace device downtown. Our machine has been detuned from factory using two teflon tubes reducing the area of water running through the steam boiler on its way to the brew boilers. The Scace creates a “like real” scenario, by letting through the same amount of water in time as a regular portafilter would (or as would happen with a real espresso). Basically it is a fancy portafilter with a temperature sensor. Whenever adjustments are made with temperature it takes roughly 20 minutes to achieve a new balance. A tenth of a degree in one second intervals is measurable but with low quantifiable accuracy. We really split hairs with trying to get both groups behaving exactly the same, however with proper calibration the Synesso machine comes close. So today we dial in our digital temperature read out to match what we think our espresso coffee feels in the portafilter basket. Our pressure with the Scace measures 114 bars. To give everyone an idea this is what we set Extracto up with, where CoffeeHouse NW was a year ago, and where we were a year and a half ago. Pressure like temperature is vital in how the espresso pours. status update- espresso machine fixed, after a 5am trip to Seattle. It has been a very long day. What should have been a box of 100 ohm sensors turned out to be a box of 2000 ohm sensors- problem. Had to drive to Seattle at 5am to pick up the correct part. Arrived at Synesso’s doorstep (the manufacturer) shortly after they opened, picked up the part and fixed ourselves an Americano before driving straight back. Tyler and David worked a double today and we are all closing together. It has been an equally long day at the roastery (Tuesday and Monday deliveries got rolled into one). whew. good news is that we are up and running with both steam boiler elements working beautifully and our one brew group. Yesterday evening we made some very satisfying adjustments on our friends three group Hydra espresso machine (made by Synesso). It helped much to be served a little buddy prior to engaging the work. The issue was a bleeding expansion valve (they all bleed, but this one was doing it too much). The expansion valve is somewhat a beast to open in place. it is perhaps the Largest brass valve in the entire machine, with the strongest spring. Each of the four tanks in a three group hydra have their own water inlet. On all inlets that lead to a grouphead there is a check valve followed by an expansion valve. Check valves only allow water movement in one direction. We want water going into the espresso machine, not back out of it (check valves are also found in all bicycle pumps and on all bicycle inner tube stems). 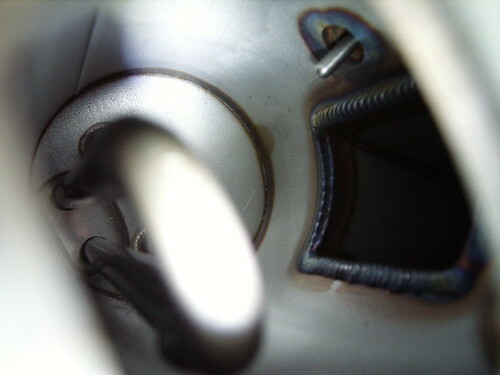 Inside the checkvalve is either a ball or piston that seals up when pressure is applied in the direction the valve is supposed to check (this is also what keeps beer taps closed- pressure, these are check valves as well). There are two kinds of tanks in an espresso machine- those completely full of water lead to the groupheads (where espresso is made), and those partially full of water (to create steam). Both of these systems need a way to safely release pressure and each has a valve that opens. These valves keep closed with a spring pressing a seal against an opening. A check valve operates in line with the flow of water, an expansion valve (or pressure release, or safety valve) is connected in line, but allows excess pressure to exit or escape the line. Air is a much better absorber of pressure than water. If we had a column of water and we tried to press that column from two ends and make it smaller we would have a very hard time, but with air there would be some give (why those fancy shoes use air instead of water as a cushion). Air has better cushioning effects versus water because it is a gas. Air and other gasses may pressurize to a much higher level because their molecules are loosely spaced and not as rigid. When one pressurizes a a super soaker it is air, not water that one is compacting. Think about pressurizing a solid on the other hand, like a rock (much harder to do). So the two different types of tanks in an espresso machine are very different. One is completely full of water, and the other half full of water and half full of gas (air, steam). The Expansion valve is named such because as cold water enters the hotter environment it expands, and there is not any air to cushion its expansion (it cannot move backwards past the check valve), so we release it from the system. There is a continual drip from this valve that is usually infrequent when not in use, and more frequent in use. The water is directed to a hidden drip pan that also collects water from the drip tray before sending it down a tube to a drain. Some people freak out when they look into their machine and see water dripping, this is a natural feeling to have, but everything is all right. In our case the other night water was dripping very frequently, so we looked further. The water shut off, excess pressure released from the line, Expansion valve removed, we simply tightened the pressure of the spring and re installed. The sealing part is a disc of teflon held against an orifice (the exit hole to our closed system). Our goal is to have the teflon seat properly with pressure against the orifice. We only had to remove the valve completely because there were a few things in our way from getting a wrench in there to make adjustments. That this worked at all was a crapshoot, it often takes a little more to get a problem disc to seat well, and the brass could have pitted or fractured due to a casting or production issue (in this case we would install a new valve). The beautiful part was that it was easy to access. In the end we did not open up the expansion valve, because it looked like we could just tighten it a little and have it seat. We were treated to a glass of Yamazaki 12 year after the work was done. This four year old Synesso Cyncra espresso machine is aging well. It still has its original solenoid valves, including the parker class H valves (now obsolete). The inside of the steam boiler is super clean. The orifices that lead to the steamwands look great. It does not even need an acid bath. New coffee arrived yesterday. Five new coffees, which we will slowly delve into. We are busy roasting, keeping up with our accounts, and building a new coffee shop at the moment. weekend machine work, fresh finca Alaska at the H&H today. People visited our workshop over the weekend and purchased coffee. We were detailing a two group Synesso espresso machine both Saturday and Sunday, imagine tiny toothbrushes and abrasive pads. Having people stop by was wonderful. This morning a lovely roast of El Salvador finca Alaska was pulled off and sent to the Half & Half Cafe, 923 sw Oak. This came along with some Guatemala finca Las Nubes, roasted Sunday afternoon. 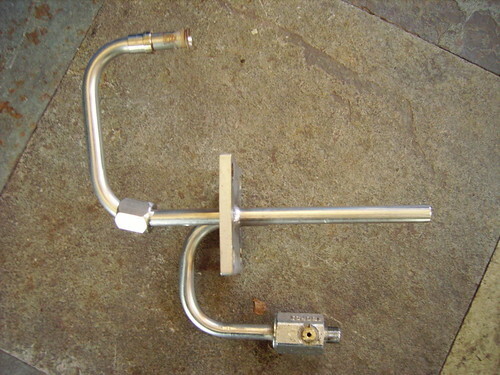 The first picture is a brew boiler for a Synesso espresso machine. 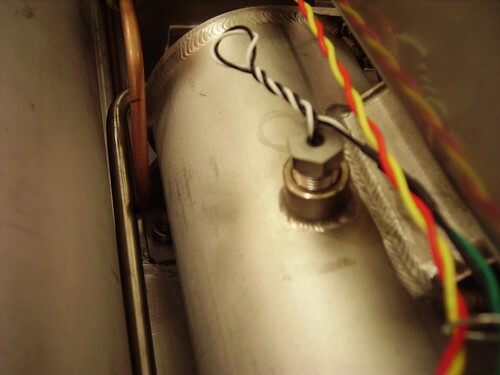 Heating element, temperature probe, shaft leading up to the grouphead itself. Then a picture of the stainless steel tubing that brings water into the brew boiler. The shorter length of tube is a service drain for the brew boiler and it only stubs out a little into the boiler, unlike the water inlet reaching into 2/3rds the length of the boiler. Today we have some big decisions to make about what new coffees to purchase. Five samples sit on the table. Alex is on the cargo bike downtown delivering coffee to offices, as soon as he gets back we will probably cup everything. You are currently browsing the archives for the synesso category.